Living by the coast has it’s drawbacks sometimes – the seasonal wind and sea fret can impact the hardiest of coastal dwellers. Just when we thought spring had settled a couple of low frontal weather systems had us scurrying to get out the winter layers again. 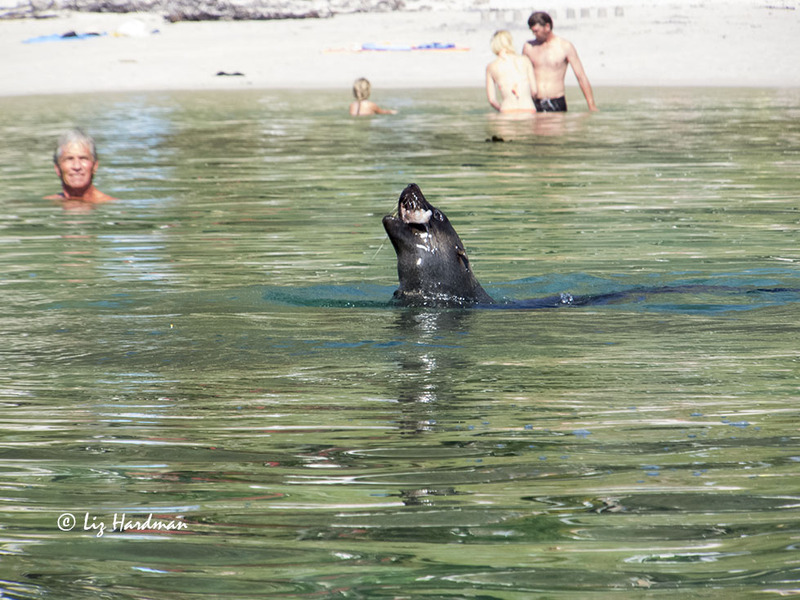 On the Atlantic side the seas were huge, and one of the unexpected visitors to our rocky beach was an exhausted young Cape fur seal. It hauled out of the water and spent the day on the rocks recuperating. Seal pups are only weaned when they are about nine months old. Baleful eyes warily watched as I attempted to remain discreetly hidden. A young Cape fur seal. Generally the dassie (Rock hyrax) colony commands rights over the rocks and sandbathing facilities, little seal was the first intruder and then up popped a Cape clawless otter. The otter stayed for a nap, sandbath and returned to eat lunch after hunting down a pyjama shark. It was all action for this photographer, as the next to appear (out at sea) were Southern right whales. Their sheer size and tonnage have us entranced and the trick is to figure what is happening out there by trying to piece together the body parts which randomly appear – a ventral fin, the size of the flukes – is it adult or newly born? Or perhaps the cavorting of mating rituals? The Southern right whales come to calve and mate in the bay from June to November. African penguin chicks losing their fine fluff and showing their “blue” coats. A juvenile African penguin accompanied by an adult. Looking sleek and probably almost ready to fledge and make off on it’s own, this juvenile’s plumage will soon change to adult colouration. False Bay is sometimes referred to as the “Serengeti of the seas” for it’s rich marine life and influx of seasonal species. Though there is the fear that many species are decreasing in numbers and little is being done to protect the resources. 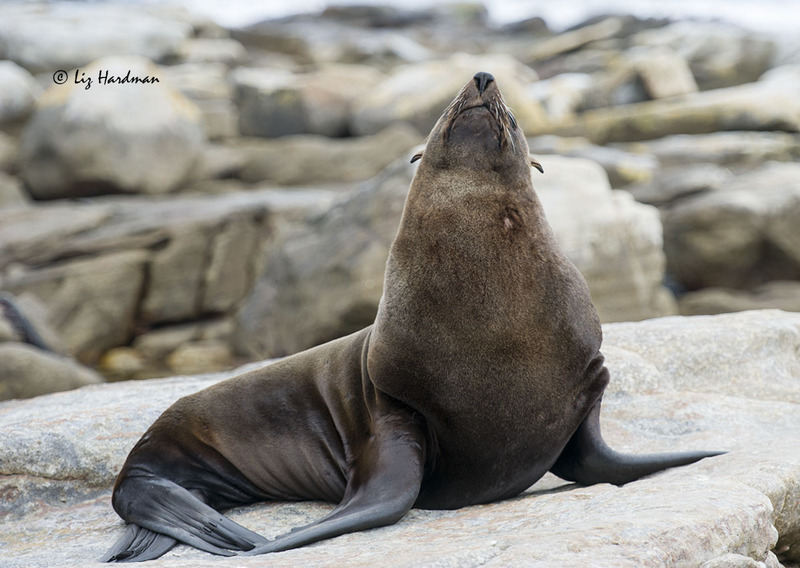 In response to this week’s photo challenge, here at full stretch, a male Cape Fur seal shows off his imposing angular form – that torpedo-shaped body is perfectly built to cleave through the water. Follow the link here to find out the backstory of the weekly WordPress Photo Challenge. 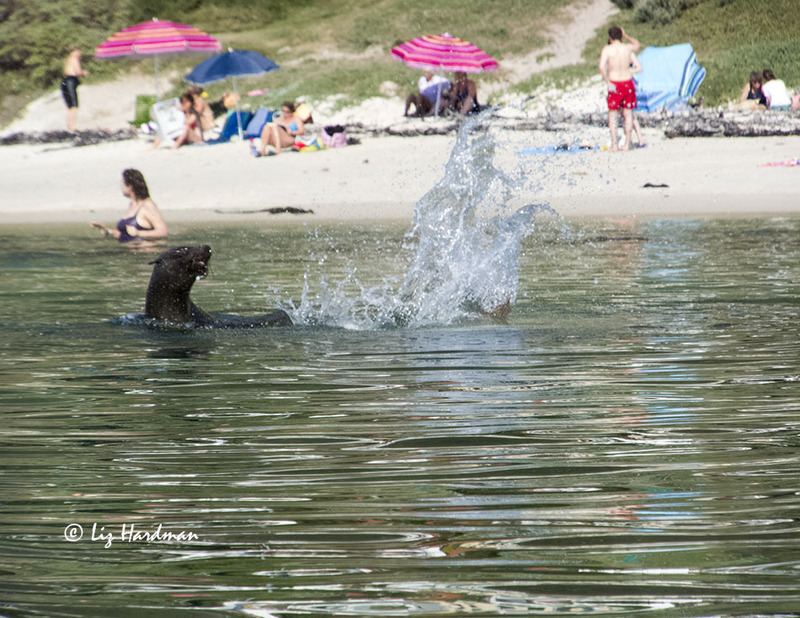 Recently during a spell of calm, sunny weather I went kayaking along the calm waters of False Bay towards Boulder’s Beach and came across a seal hunting an octopus in close proximity to swimmers on the beach. 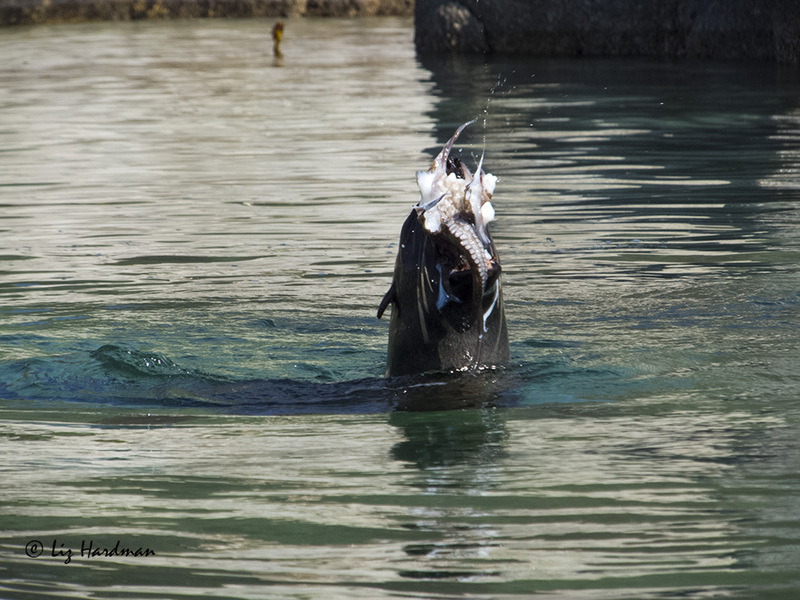 A lot of activity ensued with the seal thrashing the octopus on the surface of the water. I wasn’t sure whether the intention was to stun the octopus or use force to dismember the legs. The swimmers were completely unfazed, and there i was imagining the octopus accidentally landing on some onlookers’ head. Any sensible person would have moved away, right?! The first of the Cape’s seasonal Nor’westerly storms came barging in this week bringing strong winds of up to 70 km/h, battering the city and dropped 50mm of rain in just 24 hours. But this morning False Bay was wreathed in gold as an autumn dawn spread it’s magical touch. The birds were up bright and early with the claxon call of the Egyptian geese cutting through the morning’s quiet harmony. They’re broody at the moment, and two pairs are vying for territorial rights. Testy for sure and with their heightened decibel levels letting the whole world know. Less insistent and more melodious were the varied calls of the sunbirds, wagtails, blacksmith lapwing, prinia, hadedah ibis, but yet there was something else…… a plaintive, bleating call – much like a small child crying …..
Autumn’s golden rays herald in the day. The Egyptian geese lose no time in getting going at first light. Keen foragers, check over the intertidal zone. The oyster catchers have a distinctive call, a ‘beebah’ siren call. An exhausted young seal pup mewls quietly as it struggles with exhaustion. Cape fur seals pups are weaned by nine months, but remain vulnerable at this young age. One that didn’t make it. There tend to be more seal casualties when the seas turn rough and stormy.